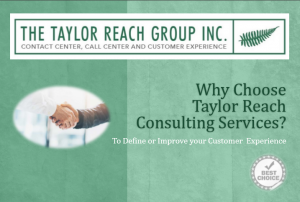 Customer Experience Offerings | The Taylor Reach Group Inc. The Call Center or Contact Center is likely the single largest point of contact between your firm and your customers. One of the key success factors for a Call Center/ Contact Center, is the customer experience (CX) being delivered. CX has significant impact on customer satisfaction, loyalty and retention and with more than half of all customer interactions occurring in the contact center, the customer experience delivered through call centers has never been more critical to an organizations success, as it is today! How customers perceive your brand, is influenced by their interactions with the company. Know you want to improve the CX delivered in your contact center, but not sure which of these 3 services suits your needs best? Complete the brief form below and one of our Consultants would be happy recommend a solution specific to your needs.